Eve Dunbar (well, it sounds a bit like Eve), the first of women and the first to taste that apple – is going to die. It’s obvious. She’s locked in a crate with no way out. It’s a horrific nightmare and Howard Linskey brings every element of that horror into stark, discomforting relief. This is a book that explores the darkest of and most terrifying of nightmares, and lays them bare. Thrillers are dependent on capturing the reader and drawing, even dragging them through the plot. Linskey takes this a stage further. The complexity of the storyline gradually begins to straighten out; different strands reach satisfying conclusions, but there is no escaping the growing, devouring, tension and menace where every page heightens the tautness, and highlights the “what-might-happen” events surrounding the fate of the main protagonists. Detectives and Journalists have a common objective – to search for and find the truth. For the police this means the constant battle for justice; for Journalists, it is meeting the siren calls of editors for stories that will excite readers. Linskey has captured that potentially confrontational relationship and, with his third Tom Carney and Helen Norton thriller, turned it into a pacey, complex and horrifically insightful novel. Tom and Helen are the freelance journalists eking a precarious living out of selling stories to mainstream media magazines and newspapers, but, while they are not averse to a commission for a lurid ‘people’ story, their mainstay is helping brow-beaten DCI Ian Bradshaw, who suffers from over-work and understaffing, as well as the constant, internal politics of a police station where every officer is looking for promotion. 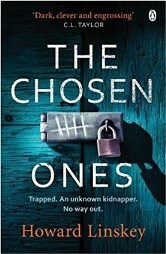 The Chosen Ones is a delicate mixture of police procedural, including corrupt officers, and the sort of journalism that is well below the parapet of high profile broadcast and print. For Tom and Helen, stories happen to them as they pursue an investigation – and that’s pretty much true to life. The Chosen Ones is a well-crafted thriller. A gentle beginning, if you consider the ever-present danger of a lonely and brutal subterranean execution, gentle, gathers momentum as the plot develops a compelling cadence to keep the pages turning. The interpersonal relationships of Tom and Helen enhance the storyline rather become a distraction, and become essential indicators of how their individual personalities handle difficult situations. The writing is immensely enjoyable; the subject matter is deeply disturbing, making this a thriller winner.